African-Americans and the authors’ considerable experiences in business, in the public eye, and in the minority, the book offers 10 revolutionary “game-changing strategies” for learning, playing, mastering, and redefining the game for the current generation, while undertaking a wholesale redefinition of the rules for those who will follow. It is not only about shattering the old “glass ceiling,” but also about examining the four dimensions of the contemporary black experience: identity, society, meritocracy, and opportunity. Ultimately, it is about changing the very concept of success itself. 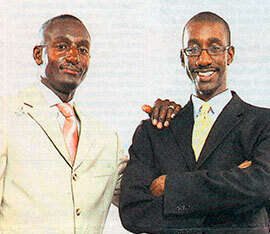 "Randal Pinkett's and Jeffrey Robinson’s book has much to say about solutions to our challenges in the age of Obama. Don’t miss it!" "There are three types of people in this world: those who make the rules, those who follow the rules, and those who redefine the rules. Drs. Pinkett and Robinson have given us a revolutionary roadmap for people of color to accomplish the latter, and to do so in a way that benefits everyone." William H. Cosby, Jr., Ed.D., and Camille O. Cosby, Ed.D. "An intriguing exploration into the personal, professional, and spiritual dimensions of being Black in 21st century America. If you care deeply about the future of our communities and our country, you should care about this book."